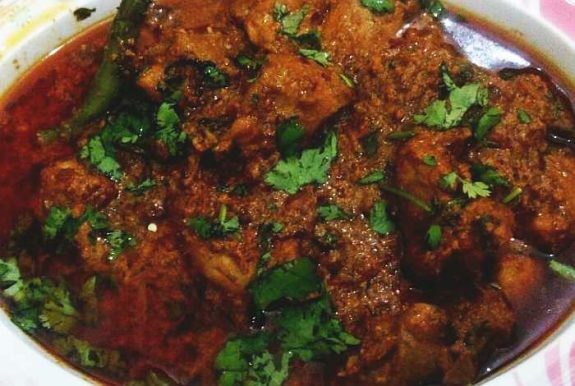 The recipe of hyderabadi chicken qorma or curry is famous through out Pakistan and India. The chicken is fried till tender in a variety of classical sub continental spices and crushed almonds. It is served with traditional bread from sub continent; Naan. The recipe was adopted from Emma Zoe’s cuisines. Chop onions and fry them in oil till they are brown, remove them from oil and crush them well. Fry whole garam masala in oil then add ginger garlic paste and cook for a short time. Add chicken pieces and fry them till they turn brown. Add yogurt to the mix and fold. Now add salt, red chili flakes, garam masala powder, turmeric, cardamom and crushed brown onions. Finely crush khashkhash plus almonds and add them to the mix. Cook well till the oil comes on top. Now add a pinch of jaifil jawitri, green chilies and ginger slices and cook for a short time. Sprinkle fresh mint or coriander leaves. Your delicious hyderabadi chicken qorma is ready to serve hot with mint chutney and naan. URDU Recipe: Onions brown krien oil mein, phir sab nikal lien or achi tarah kut k alag rakh lien. Oil me sabat garam masala krkraein phir adrak lehsn paste aur chicken dal k fry krien k golden hojaye. Phir usmein phainta hua dahi, salt, pisi degi lal mirchien, pisa garam masala, haldi, choti ilaichi or kuti hui pyaz, badam aur kashkhash pisay huay, onion paste dal k pakayien jab sab bhun jayay aur oil chor de to jaifal jawitri pisi ek pinch, adrak barik kata aur hari mirchien dal k thora pakayien.